[prMac.com] Luxembourg City, Luxembourg - Houdah Software today released HoudahGeo 5.0, a major upgrade to the photo geotagging tool for Mac OS X. HoudahGeo tags photos with location coordinates and names. Standard EXIF, XMP and IPTC geotags allow photo cataloging tools to organize and later find photos by location. HoudahGeo integrates with Apple Photos, iPhoto, Aperture and Adobe Lightroom. Geotags add to the "story" of a photo. A photo pinned to a map - at the exact spot where it was taken - has context. A series of tagged photos documents the path taken. Geotags allow photo cataloging tools like Apple Photos to group photos by location. Even years from now it will be easy to find these photos. Photos taken with iPhone are geotagged in-camera. Photos taken with regular digital cameras - sometimes our best photos and most precious memories - lack geotags. This is where HoudahGeo steps in. HoudahGeo tags digital photos with GPS location information. HoudahGeo writes future-proof EXIF and XMP tags to JPEG and RAW image files. Just like a GPS-enabled camera. HoudahGeo supports many methods of geocoding, ranging from automatic to manual. Use a GPS track log, reference photos taken with iPhone, or pick locations on the built-in map. HoudahGeo can create Google Earth KML and KMZ files from GPS tracks and photos. This allows for viewing (and showing!) photos "pinned" along the path travelled. 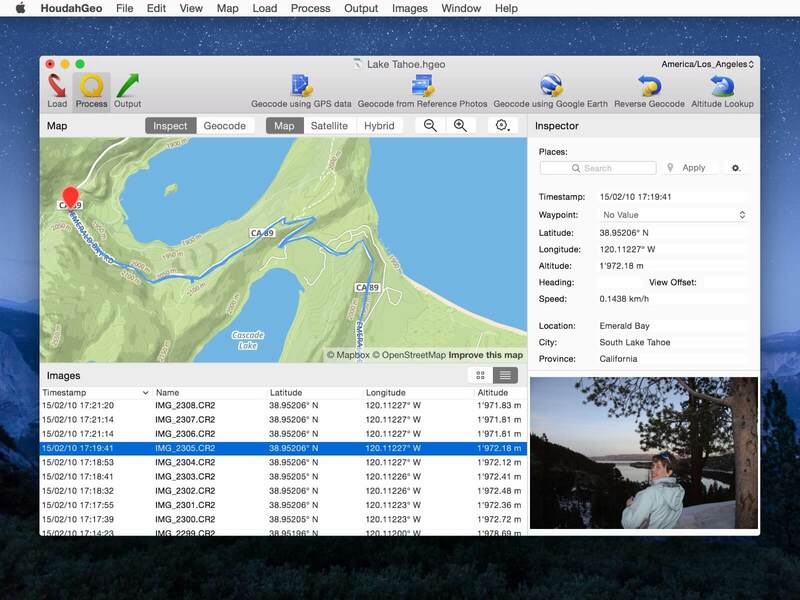 HoudahGeo 5.0 is priced at $39 for a single-user license. A full-featured demo version is available. Licenses are available from the Houdah Software store. Upgrade from previous versions start at $19. Upgrades are available through in-app purchases. HoudahGeo licenses purchased on or after December 1, 2015 remain valid for HoudahGeo 5. Prices are in USD and exclusive of tax. Founded in 2005 by Pierre Bernard, Houdah Software s. r.l is a small company based in Luxembourg, Europe. Houdah Software specializes in quality software for Mac, iPhone and Apple iPad. Our mission is to pair quality products with excellent customer support. All Material and Software Copyright (C) 2005-2016 s. r.l. All Rights Reserved. Apple, the Apple logo, Macintosh, Mac OS X, iPhone, iPod and iPad are registered trademarks of Apple Inc. in the U.S. and/or other countries. Other trademarks and registered trademarks may be the property of their respective owners.